Filipino photography enthusiast Ruben Ranin nails this photo of one of Philippine’s city treasures, the Manila Cathedral, as his winning masterpiece at the Canon PhotoMarathon 2017. Passion, perseverance and preparation were key for Ruben Ranin, the Philippine grand winner of the Canon PhotoMarathon 2017. 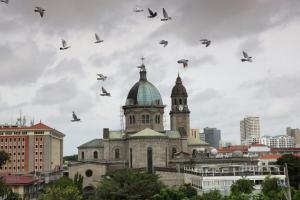 After three attempts to take a spot at the largest on-the-spot photography competition in Asia, Ranin’s fourth try this year did him justice, and rightfully so, as his spectacular shot of doves flying above the infamous Manila Cathedral in Intramuros, Manila using his Canon EOS 5D Mark III. “When I saw the theme, City Treasures, isa lang nasa isip ko [I only had one thing in mind], the Manila Cathedral,” shared Ranin, who admitted that he got his money shot after 20 attempts. “[But] I wanted something that will add spice to the photo, a human element, or something that is moving. There should be something moving,” to which he proceeded in elaborating how he had to endure the Manila noon heat atop his friend’s house, wait for hours for the doves to circle the area, and trust his camera’s capabilities to capture the perfect shot that he wanted. Ranin, 38 years old, has always wanted to win at Canon PhotoMarathon. He is a General Manager of a meat company by day but consistently pursues his love for photography on the side, particularly favoring landscape, travel and street photography. He first unearthed his enthusiasm for photography five years ago and has been a Canon user ever since. He said that he had prepared for the competition with a set strategy to overcome the real challenge of a surprise theme and time pressure. He shared that he had to do thorough research after his previous attempts, kept in mind how the previous winning images looked like, and really took time to survey the surroundings of the competition venue. He also took the advice of his friends to rest up the day before to keep his mind sharp and focused, but had to make sure to be one of the firsts to arrive at the venue even before day break. During the competition, Ranin was all out determined to win the 2017 Canon PhotoMarathon. He was unfazed by the pressures that surrounded it, including having to compete with more than a thousand participating Filipino photography lovers. At the end of day, with his talent, creativity, and the help of his Canon EOS 5D Mark III camera, his entry sealed a unanimous decision among the judges, which included Canon ambassadors Jun de Leon, Jun Miranda, Sara Black, Jay Tablante, Jay Jallorina and Dino Lara. They judged more than two thousand photographs on that day according to relevance to the theme (50%), creativity in theme interpretation (30%), and the composition of photography with the use of lighting, exposure, and focus (20%). Aside from his most recent success at Canon PhotoMarathon 2017, another item on Ranin’s list of achievements includes winning an online photo competition hosted by the United Nation World Tourism Organization last 2012. “I took photography because I want to capture life and colors. I want to inspire other photographers, especially the new ones, the enthusiasts, to take photos, learn from it, and try to inspire others with the photos that they take,” he added. In humble achievement of another milestone in his life, Ranin gets to enjoy a number of Canon products, notably the newest Canon EOS 6D Mark II DSLR camera and a Canon PIXMA G3000 printer. He is also set to represent the Philippines at the Canon PhotoMarathon grand finals in Japan next year.